One thing that's hard about this series is the glut of air-cooled Volkswagens on the island; I could easily do nothing but 60s Beetles and Transporters for a month straight and still not run out. These VWs are survivors and fully deserving of recognition, of course, but it wouldn't do to have them shove aside all the other cool machinery in this series. Rationing has been necessary, but it's been a while since our last Transporter (so far we've seen a '56, a '57, a '62, a '63, a '67, and a '70), so let's look at a very nice 48-year-old example today. And, what the heck- let's have a poll! This '60 parks very close to the 1960 Studebaker Lark and the 1955 Plymouth Savoy. 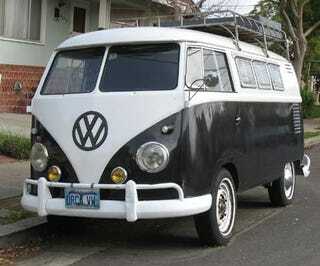 Vintage VW Type 2 owners will spend the rest of eternity screaming about how they're not hippies. Hell, real hippies haven't been able to afford these things for many years- they're driving 20-year-old Tercels now. These vintage travel stickers are great, but I can't help but wonder if they've been there all along or are reproductions.